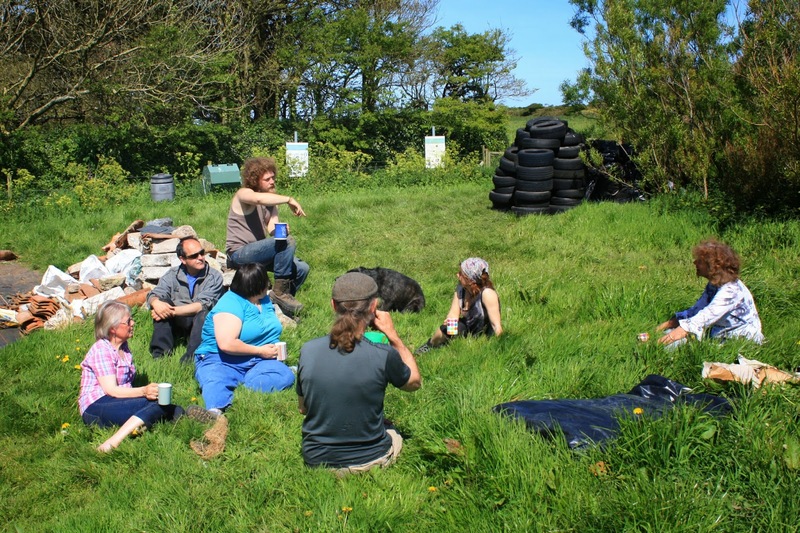 Bosavern Community Farm was very pleased to host 40 staff of local YMCA projects to the farm today for their annual team-building day, and also pleased that one local charity decided to support another local charity in this way. 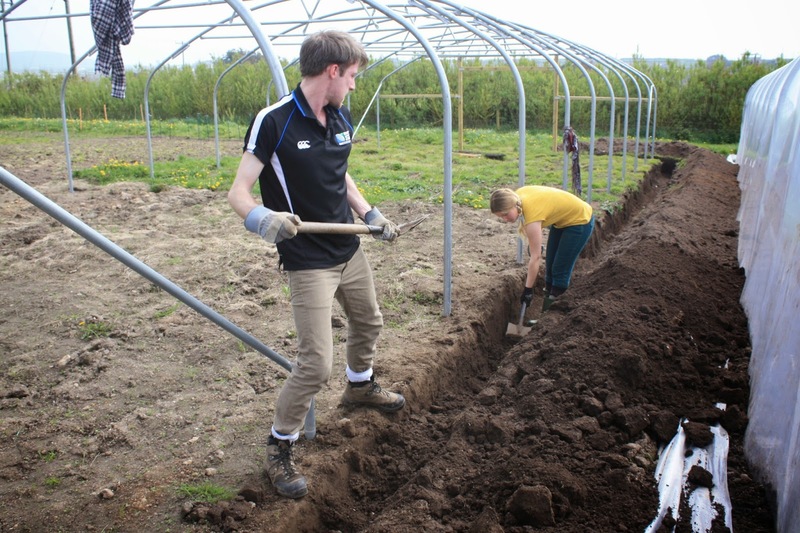 The YMCA enjoyed something a bit different for their day, and the farm got a huge amount of work done in a short space of time - many thanks to 40 hard workers! 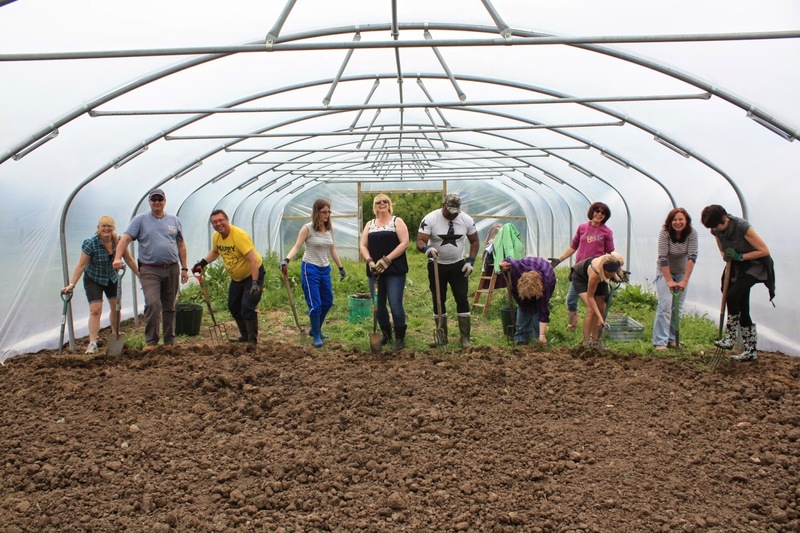 One team digging over the inside of Nigel the Fifth polytunnel. 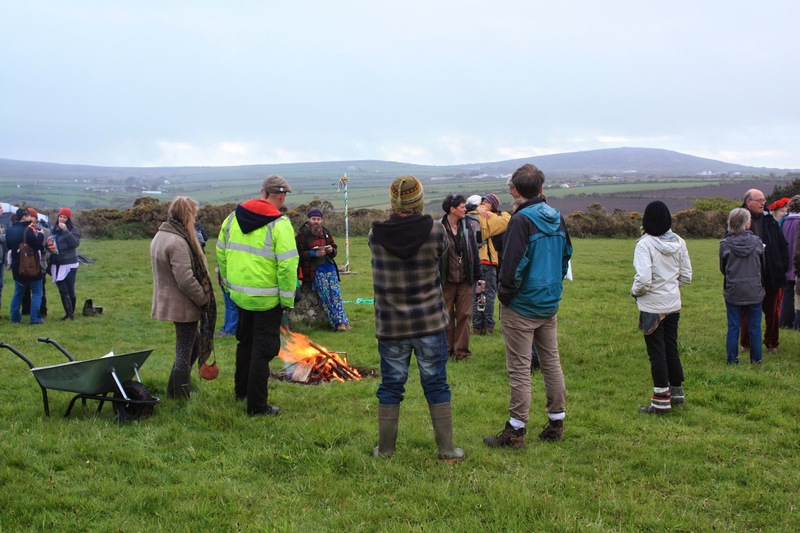 The group of 40 split into 4 teams and undertook 4 tasks for about one hour each task, in rotation, interspersed with drinks breaks and lunch in the open barn. 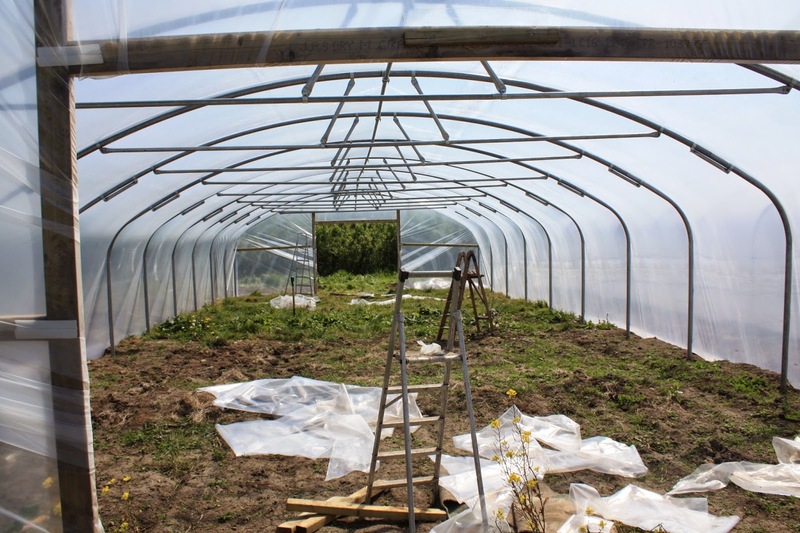 Clearing spent salad plants from inside the Sausage polytunnel. 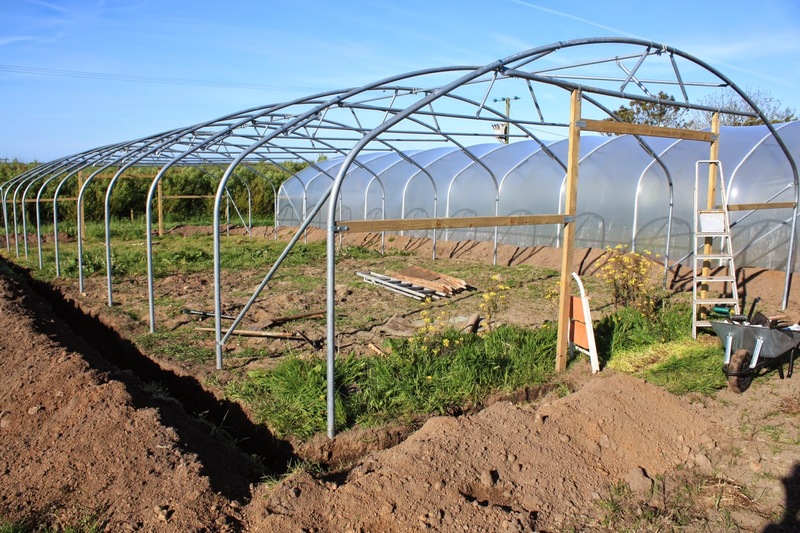 These tasks included erecting the farm's new fruit cage (at the end of the day all the foundations were in and most of the poles up), painting the chicken sheds (all 3 sheds painted by the end), digging over the inside of our newest polytunnel Nigel V (half the tunnel dug, a good achievement for one day), weeding and removing black plastic mulch from the market garden field (good inroads were made), and clearing bolted salad plants from the Sausage polytunnel (all done and ready for cucumbers and peppers). 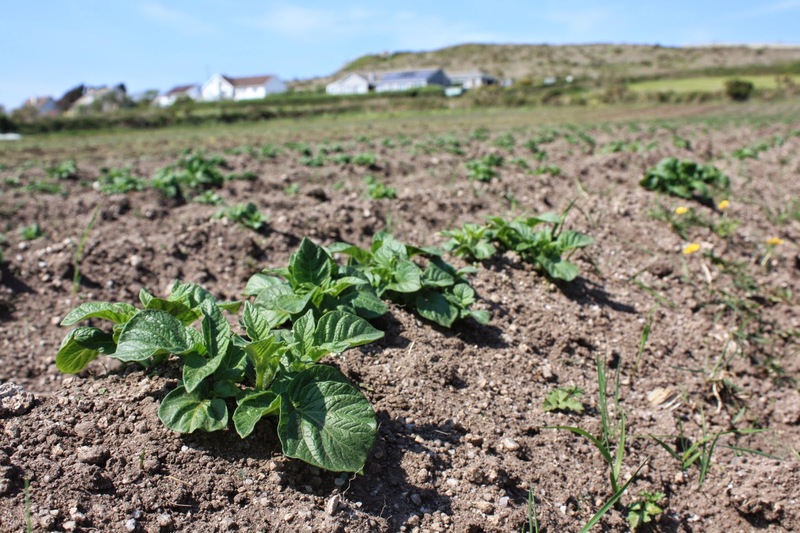 Weeding broad beans on the Market Garden Field. Lunch buffet in the open barn. 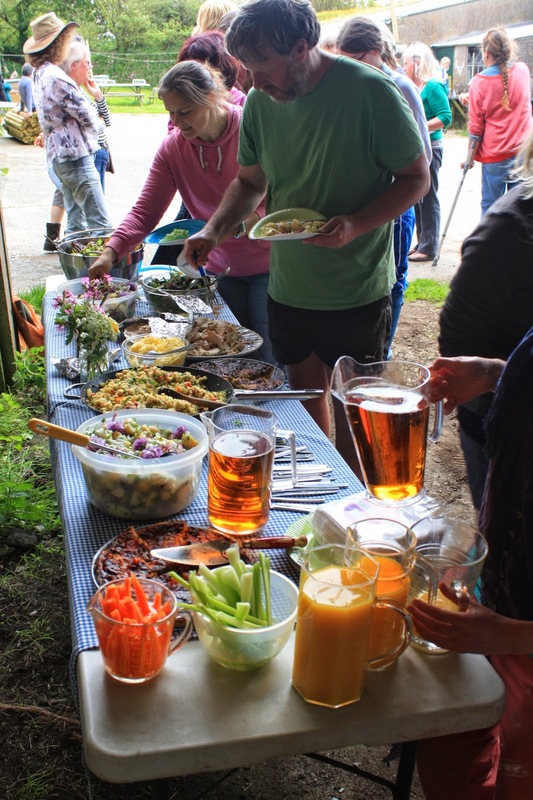 Lunch was provided by the farm, including one of our own turkeys, various salads including our own salad leaves and edible flowers, quiches from Alison from St Just Farmers Market, and lots of home-made cakes. Another group getting instructions for fruit cage building. The day ended with a quiz about the farm to see just how much everyone had learned. 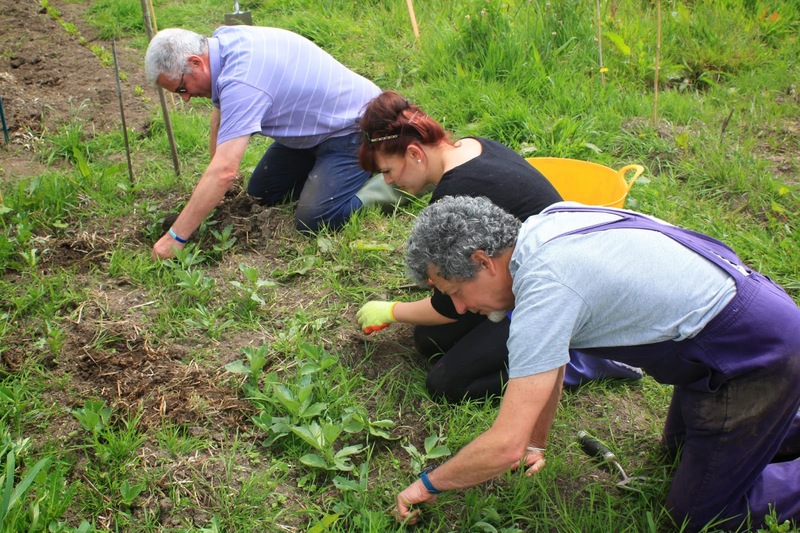 Thanks again to the YMCA for choosing us and for making such a positive contribution to the success of the community farm, and also to all our volunteers who helped organise the event and who got their hands dirty helping on the day! 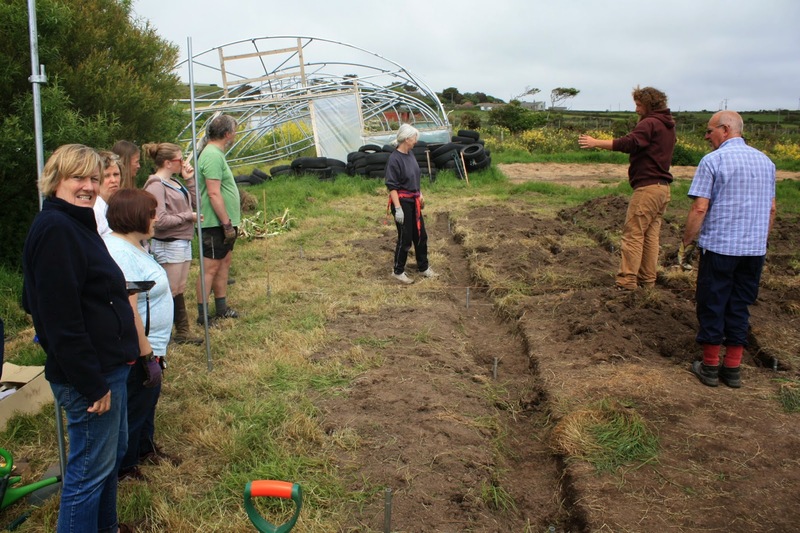 Many thanks to Viktoria from Berlin, who left the farm yesterday after more than three weeks volunteering as a wwoofer. 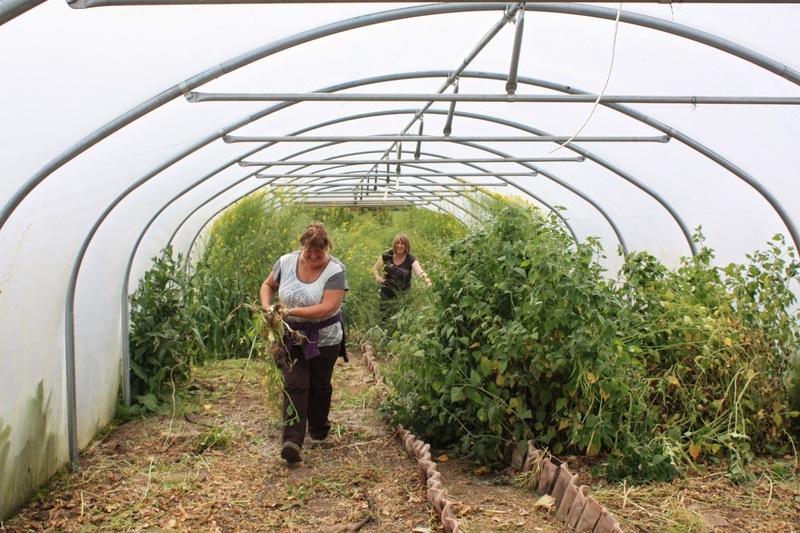 Viktoria on the right, digging a trench for polytunnel plastic with her fellow wwoofer Peter. Spring celebration on May 31st. 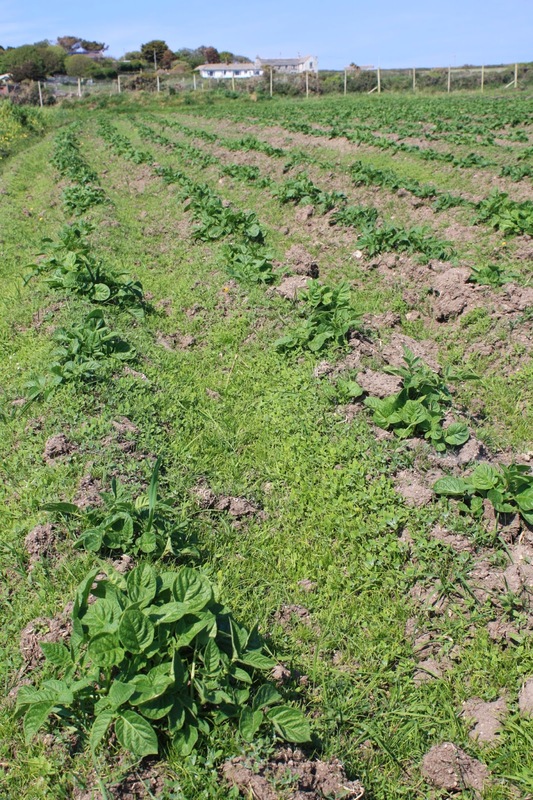 Long lines of picasso in four-acre field. 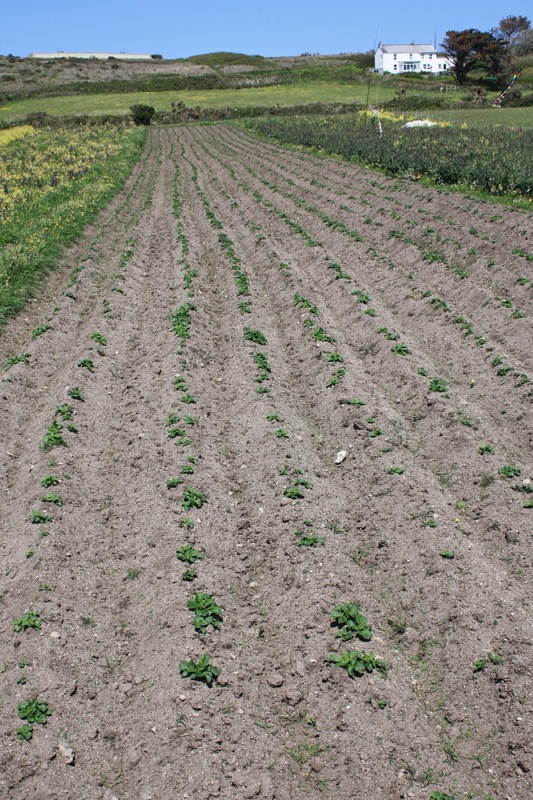 Rocket early potatoes ready for ridging. First thing in the morning, ready for skinning. Morning coffee break with the skin over and semi-secured. The skin on, doorways cut and battened. We'd like to thank all the people who volunteered their time to help with the skinning - Kate B, Kate G, Pete, Anne, Andrew, Jenny, Holly, Jamie, Lisa, and Martin. Saturday 3rd May in the Plen-an-Gwary ancient theatre in the centre of St Just saw the May Fair in aid of the Lafrowda Festival. 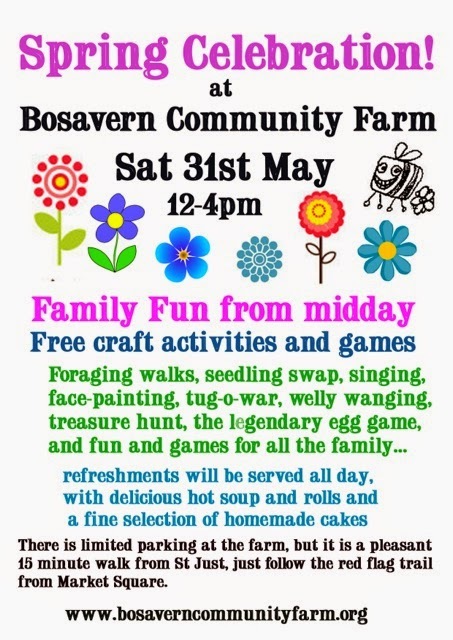 Bosavern Community Farm had a stall there for the second year running, doing a good trade in eggs, veg, dried chillies, plus a range of local artisan soaps, raw chocolate, jams, chutneys, hand creams, and other preserves. 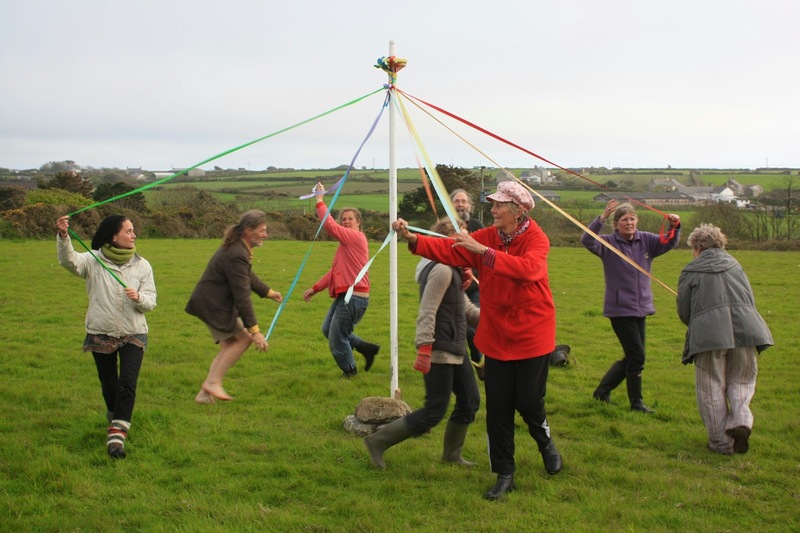 As well as the farm stall there was more maypole dancing, pink flamingo croquet, a cafe, guide stall, pottery, face painting, children's art workshops, a jumble stall, barrel organ, and other fun things. 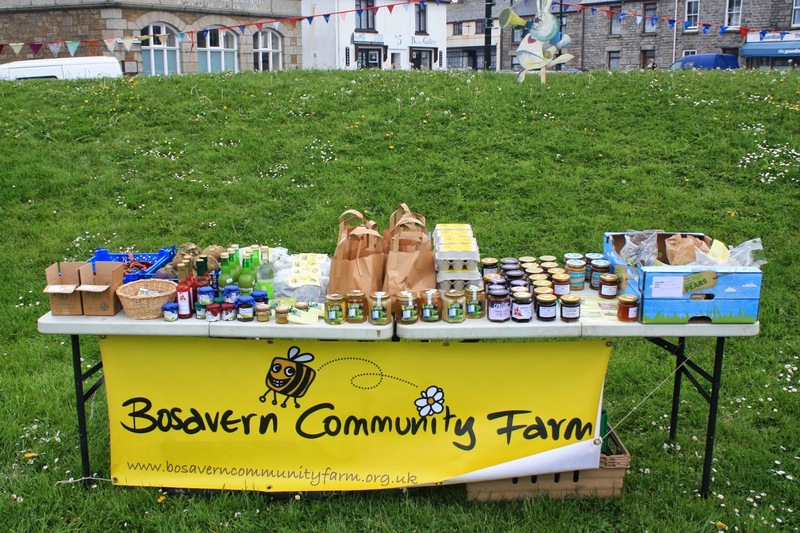 Many thanks again to our volunteers for running the stall for us (as well as the simultaneous Pendeen Farmer's Market!). 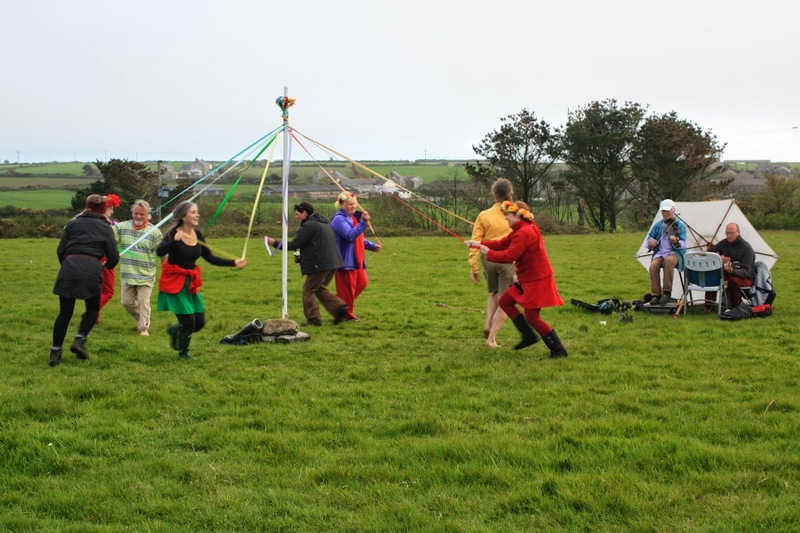 Beltane at Bosavern - the fourth year. 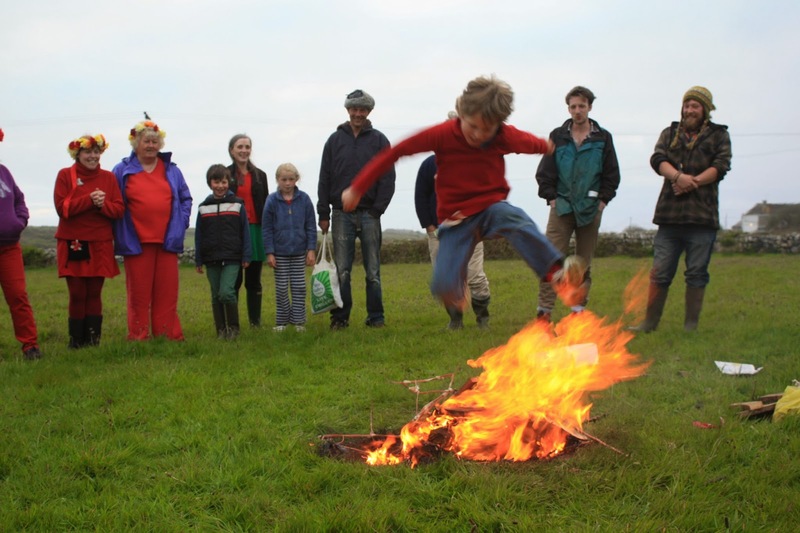 On the final evening of April we celebrated Beltane out in Standing Stone Field for the fourth year in succession, with maypole dancing, live music, shared food and drink, and fire leaping at sunset. The evening was beautiful, with dramatic sunlight across the sea and mist rolling over Castle Carn Brea and Bartinney Beacon. Special thanks to Mike and friends for the music, and to all those who helped organise the evening. Many thanks to Peter who escaped London for a week to come and wwoof on the farm, and left today to head back to the city.